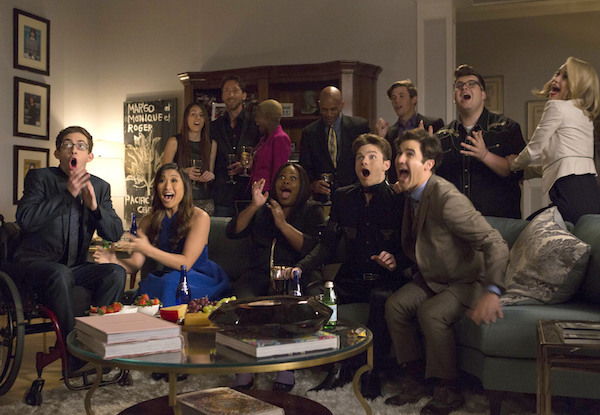 Glee closed out its 13-episode final season tonight with two hours of music, nostalgia and wrap-up. Much in the way the season had its ups and downs, so too did the final two episodes, the first of which was sort of a clip episode, and the second, the expected flash-forward to show us where everyone ended up. Happily ever after ensued, with plenty of music and some emotional moments interspersed. Glee hasn't always been the most even of series, likely due at least in part to its efforts to balance the arcs of a shifting and growing (and sometimes geographically separated) ensemble. If Glee's been consistent in three things, it's humor, heart and music. All of those have been amply present in the Fox musical dramedy's final season. Season 6 seemed determined to juggle old characters and new, while also steering the series toward its inevitable conclusion. There were moments of genuine hilarity (see the Sue-heavy two-parter "The Hurt Locker"), romance (The double wedding for Brittany/Santana and Kurt/Blane in "A Wedding"), and randomness ("Child Star"). All of it felt like it was pointing toward "the end," but it was happening piece by piece. With "We Built This Glee Club," the (somewhat) penultimate episode to the finale, Glee managed to recapture some of its original charm and inspiration when the newbie-New Directions performed a fantastic medley that proved they had the chops to bring the club back to glory. In a way, "We Built This Glee Club" felt like an ending by itself. Or, at the very least, a fitting tribute to the original Glee Club with a new crop of mismatched music enthusiasts looking for their chance in the spotlight. New Directions was back to form, ensuring that the glee club would live on. The final two hours of the series took that a step further with a look back and then a jump forward. "2009" was almost like a clip episode, but it might be more accurate to call it something a remix, working original sequences from the pilot in with new scenes that retold the origins story of New Directions, filling in some blanks, including the revelation that Artie and Tina auditioned for Glee Club on a dare, and the non-revelation that Kurt was trying to appease his father by joining something. Mercedes was reintroduced as Rachel's competition, and understandably, Finn was referenced more than he was seen. But the episode ended with the series-defining "Don't Stop Believing" performance, which put Cory Monteith and his singing talents front and center for us one last time. "2009" offered the opportunity for new musical numbers, including a wicked performance of "Popular" for Rachel and Kurt. And amusingly enough, the episode worked in an appearance by Blaine, who wasn't actually introduced to the series until Season 2. Story-wise, the episode felt like Pilot 2.0. Was it necessary to film new scenes to revisit the origins of New Directions? Not really, but the episode served the necessary function of reminding us of how it all began before showing us how this story was going to end. Re-airing the pilot might've also done the trick, but the emphasis on Rachel, Tina, Artie, Kurt and Mercedes' origins and aspirations, rather than on Will's efforts to revive the glee club. Kurt and Blaine are still happily married and mentoring youths on loving themselves for who they are. Mercedes was invited to open for Beyonce on her world tour, after which she went on to record her own music. Tina and Artie appear to be together. Artie made a movie that he intended to be for Mercedes, but Tina ended up starring and it made it into Sundance Slamdance Film Festival. Sam was named New Directions' new coach. It's a fate that sounds somewhat similar to the plan Ryan Murphy had for Finn, had Cory Monteith not tragically passed away. In a touching eulogy to Monteith, Murphy said he had intended to make Finn a teacher, happily settled down in Ohio. It's fitting that Sam should end up being the glee club coach. Like Finn, his kindness was always one of his best attributes, and that should suit him well as he leads the new New Directions. Sue was elected Vice President of the United States, serving alongside President Jeb Bush. Becky appears to have earned a spot on Sue's Secret Service guard. Finn was memorialized in name through WMHS Auditorium. And his photo was shown when Rachel took the auditorium stage to perform a song, and again at the end of the episode. 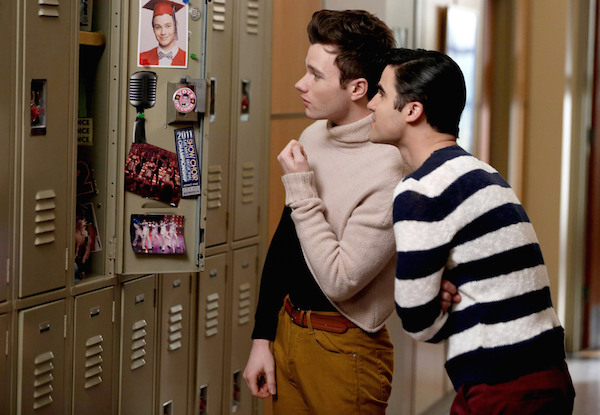 We also saw a glimpse of his smiling face in Kurt's time-capsule locker. Rachel was very pregnant (as the surrogate to Kurt and Blaine's baby) when she took the stage to accept her first Tony award. Her husband (Jesse!) was in the audience. And Will was at home with his family (and Sue!) watching as Rachel tearfully thanked him for all of this support. Rachel also thanked her NYADA mentor, which indicates that she followed through on her plans to finish her education before going on to take Broadway by storm. The final moments brought everyone back together in the auditorium for one final musical number, that served as the perfect, uplifting close to Glee's musical epilogue. Farewell Glee. Thank you for the endless song covers and outstanding vocal performances. Thanks for the laughter. Thank you for Sue Sylvester's hilarious meanness. Her bitterness was perfectly paired with the series' red-slushy sweetness. Thanks for the romance and the heart and for always pushing forward, even through graduations, new settings and awkward transitions. Thanks for your emphasis on acceptance. And of course, thanks for all the music.